In Woodworking and Metalworking. A powered drill that has the chuck pointing at right angles to the shaft of the motor. Usually in larger sizes and useful because it can work in a smaller place than a standard drill. An accessory for a standard drill that makes the drill easier to work in confined spaces. A larger size electric drill that has a reverse switch that can be used to back the drill bit out of a hole in the event a the bit jamming in the workpiece. 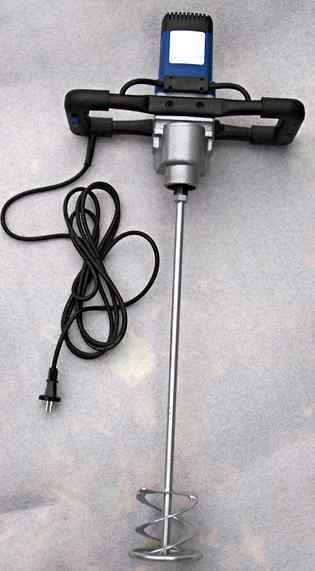 A larger size electric drill that has the handle enclosed. 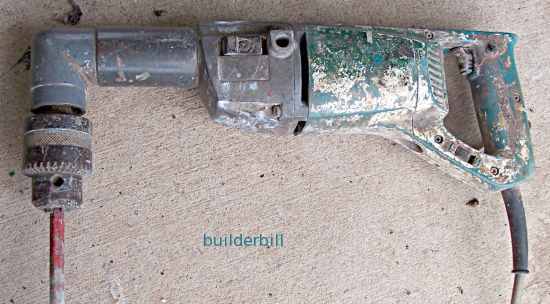 A larger size electric drill that has low gearing. Used for drilling steel and also used with mixer attachments for mixing grout, ceramic tile cement, plasterboard adhesive and toppings etc. 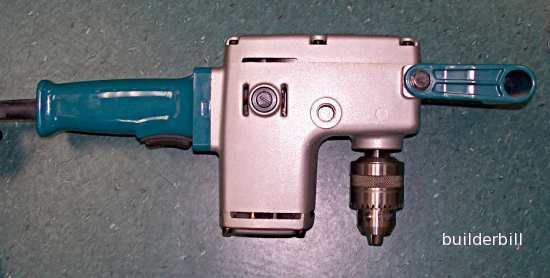 An electric power tool similar to a drill, but with low speed and using special tools for mixing paint, grouts and adhesives. The drill in the photo is a 12mm Makita DA6300. It is a two speed reversible right angle drill and the speeds are 300rpm and 1200rpm. It comes with an extra long side handle. It is a purpose made heavy duty 12mm drill ("Triple reduction gearing for maximum power"). The arrangement of the handles gives the operator extremely good control and a two handed grip that can resist the twisting forces if the drill bit grabs or sticks in the work. A "D" handle drill, this time with a right angle drill attachment to rotate the angle of attack by 90 degrees. This drill already had four speeds but when fitting the accessory there are two ways it can be fitted, with lower or higher gearing. All drills of this size are reversible. This particular drill set-up has done a lot of work drilling for fixing rafters and joists to cleats where a standard drill (with enough power to do the job) would be too long the use. Low speed drills like these have the torque to spin a large mixer for quicker mixing, but because of their low speed there is little air entrainment. A Power Mixer is a specific tool used by tilers and many other building and construction trades. Many ceramic tile adhesives, grouts and mortars come in powder form and need mixing with water. Paint and liquid epoxy formulations all need mixing before use. The use of an ordinary drill with it's higher RPM lead to air being trapped in the mixture which is a bad thing. These mixers are in general low revving but some models have speed control and some have what is know as "soft start-up" which means that they start slowly. Because they use quite large mixing tools they all have large double handles to make holding them comfortable. They do not use a three jawed chuck like a conventional drill but they use a similar arrangement to hammer drills with their proprietary fittings, SD etc.